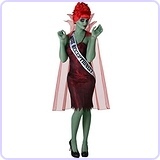 Forget the “ghost with the most!” Civil servants are the REAL spooks in town, and none so popular as former 1939 beauty queen and Netherworld receptionist supreme, MISS ARGENTINA! Oh you don’t know what I’m talking about? *sigh* You probably haven’t even read through the manual completely yet…. Attention K-Mart shoppers! 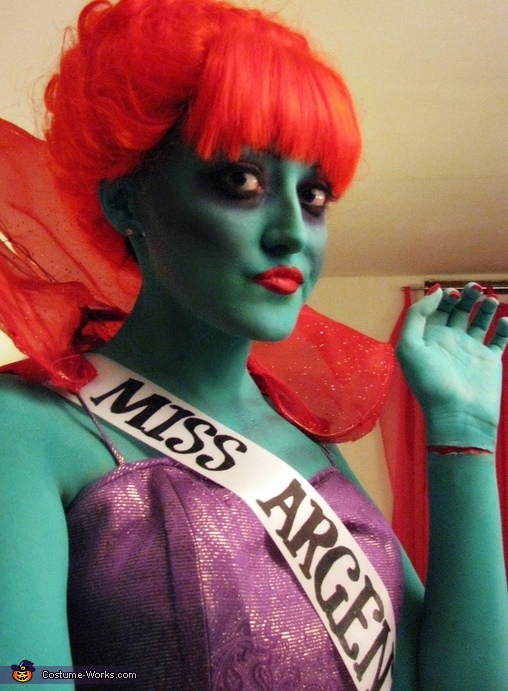 Without further delay, I present to you my handmade, 2013 Miss Argentina costume. I have got to say that this was THE BEST and most fun (not to mention time consuming) costume I’ve done to date! I have been a fan of the movie Beetlejuice since I was a mere toddler (long before that Robin Thicke/Miley Cyrus fiasco...ugh) I’m proud to say that I even own a copy of the soundtrack, which I can listen to and play out the movie in my head because I’m.just.that.good! (or that much of a nerd) Now despite Miss Argentina’s short screen time, her character always stood out to me. I remember being really little and thinking she was so pretty in my own oddball way. All of these factors are essentially what lead me to recreating her this year, but not only did I want to dress up as her for Halloween...I wanted to do her character justice! I take my costumes very seriously and study every detail with extreme precision; a real blessing and a curse at times since I’m by no means a professional. An example of my attention to detail with this costume is the date ‘1939.’ VERY few Miss Argentina costumes out there have this date included on the sash because they only know of her behind-the-desk scene. Grab an HD copy, slow-mo/pause, and you will see her full self taking the Maitlands into Juno’s office later on in the movie. Yeah! That’s right! Needless to say, I’m THRILLED with the way this costume turned out and hated to take it off! I’m not good with hair or wigs for that matter, so I had someone shape and design a red wig for me, and I was very pleased with how it turned out. The Handbook for the Recently Deceased is simply an old book, glued shut with a graphic wrap around it that’s been weathered to look old and dirty. Lastly for the makeup, I bought several sample palettes beforehand to test out the different greens and get the right shade. I ended up using Wolfe FX face paint in Sea Green and it turned out perfect. I used a translucent powder over top to give it some hold. This stuff REALLY lasts. I didn’t have a problem with it coming off minus the places where my dress/cape rubbed. By the end of the night it still looked fresh. Everything else was just various purple eyeshadows. I went all out on the makeup and didn’t get tights or anything of the sort to do a half job. I painted my ENTIRE BODY, even around my little toes which were freshly painted a fire engine red ;) Overall the painting process took about 7 hours. As for the infamous slit wrists, I used Tinsley Transfer 3D latex adhesives. These things looked great! Very realistic. You're costume looks AMAZING! You did SUCH a good job! Kudos! How much paint did it take to cover your body? Love it :) awesome job! What color of paint did you buy? Sol-Sea Green. Wolfe FX brand. Amanda- is there a way I could get a hold of you to ask a few more questions via email? this is absolutely awesome and I wanna nail it! Where did you get the wig? How would you describe the color? Bright Red Wig? Hi Amanda...Where did you get the wig?? The best part on this costume is the wig! I was so attracted on the color and can't help to contact my wig maker in Washington, DC to get me one. I just love it. Keep going! !